What can a Pilates class do for me? What can’t it do for you is a better question. 1. Increase your muscle flexibility and strength. 3. Improve your Balance and coordination with exercises that focus on whole body movement. 4. Improve your lung capacity with efficient breathing techniques. 5. Strengthen your core musculature or your “powerhouse,” the source of energy for all other body movements. 6. Train you in correct movement techniques to reduce your chances of injury and soreness. 7. Reduce stress and tension in the body through mind-body focused exercises. 8. Have fun! The exercises are challenging but fun as you will learn to play, and balance, and roll like you did as a child. 9. Increase your energy and leave you feeling invigorated. Through the low impact stretching exercises you will not leave feeling exhausted and bogged down. What kind of Pilates Class is available to me? This is a must if you have never done Pilates before. It will challenge you but teach you the basic (fundamental) exercises, which you will need to master before you move on to the more advanced classes. If you try to move on too soon you may injure yourself or not get the full benefits out of a higher level. The repetitions are generally lower, around 4-6 for each exercise. 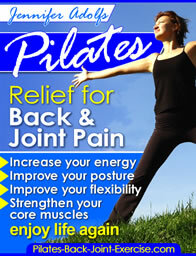 Check out this new Pilates DVD for beginners and for anyone who wants a healthy back and joints. This class is a step above the beginner level with an increase in the challenge of the exercises, coordination, concentration, and the repetitions may increase to 6-8 reps per exercise. Only once you have mastered the beginner and intermediate level exercises should you move on to the advanced level. These Pilates exercises are the most difficult and require a mastery of the fundamentals and intermediate level exercises before performing them. This will help to reduce your risk for injury and allow you to receive the most benefit. Remember you may not be able to perform all of the exercises perfectly, but strive for the best and most perfect form in your own body. Every Pilates body is different, some of you will do better than others on a particular exercise, just as someone else will be better able to perform other exercises. Don't get frustrated just do the best you can each day for each exercise. Work at your own pace and within yourself. Pilates on the ball is a more advanced level class as the instability of a ball challenges your core strength, and, in turn your balance. This is a fun way to do Pilates once you have mastered the above classes. Generally a Pilates ball class is done with a 55cm ball. This ball is smaller and more manageable for the mat exercises. Pilates band exercises can make the mat exercises more or less challenging. For instance the leg circles are assisted with the band by supporting the leg weight and allowing for more range of motion and stretch. There are several good upper body strengthening exercises that you can perform in the band class as well. A Pilates band class is for all levels that have some background practice in Pilates. What kind of shape do I need to be in to do a Pilates class ? Well, beyond the hype that Pilates is hard, you can go in without ever having done exercise before if you find the right instructor and class. When you first join a Pilates class the instructor should ask you whether you have any health conditions that may limit you. If their class is not suitable they should be able to recommend you to another class. I teach Pilates to all ages and abilities up to 92 years old that have never done it before and now they are singing the praises. With a good instructor and appropriate level class everyone should be able to work safely and within their own limitations. To get a jump start on your Pilates class safely and inexpensively today try out the exercises in the new Pilates ebook available here.